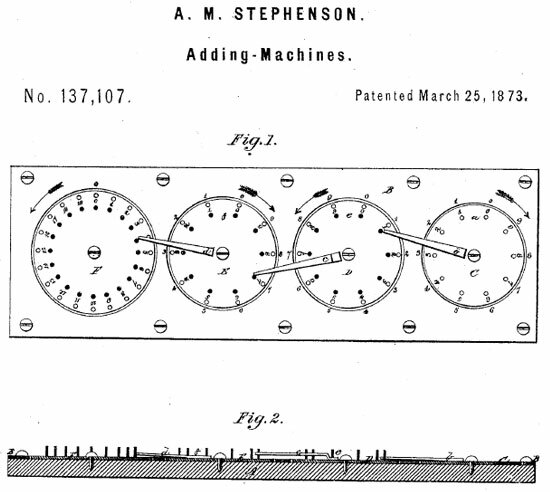 Archibald M. Stephenson (1844-1913) of Manteno, Illinois, took out a US patent №137167 for Adding Machine on 25 March, 1873 (see the lower patent drawing). Despite its very simple construction and operation, the Stephenson's adder was perhaps actively being sold as late as 1929, a period of 56 years! The original Stephenson's Adding Machine is a four-wheeled stylus-operated adding machine with a rectangular wooden base and an automatic carry, made by wood, paper and brass. Measurements: 2 cm x 26.6 cm x 9 cm. Four adjacent rotating wheels are inset in the wooden base, with a metal cover that fits over them. The three small wheels on the right each have a metal arm pivoted at their centers and ten evenly spaced indentations around the edge. The digits from 0 to 9 are marked on the cover just outside each of these wheels. The numbers increase counter-clockwise going around the first and third wheels and clockwise going around the second wheel. The two middle wheels also have ten pins arranged just inside the indentations. The pins of one wheel are linked to the arm of the wheel to the right of it. The fourth, leftmost, wheel is larger and has 20 indentations and 20 pins. The indentations are numbered from 0 to 19 going counter-clockwise. There are no detents shown, which could make the actions erratic. Stephenson probably never made any adders of the original design (besides the patent model). For the production devices he modified it heavily, reducing the number of dials to only two, and adding a single detent (to stop the leftmost wheel from turning further than one position when the tooth from the rightmost wheel engages it). The two-wheeled versions were sold at least up to the end of 1920s under a number of different names (Perfection Adding Machine, Universal Adding Machine, Mindling Vest Pocket Adding Machine, etc. ), made by different manufacturers (including the Stephenson's own workshop in Joliet, Illinois), which are sold in the end of 19th and the beginning of 20th century for $1-$2. In the two-wheeled production version (see the lower photo), the user may enter only single digits in the right wheel. There is also an automatic carry to the left wheel, which registers up to 19, so that the maximum sum is 199. The Stephenson's adder seems to have been an aid for people adding long columns of figures using paper and pencil. The device is only 3.5 inches long, 2-3 mm thickness, and is constructed entirely of brass. Numbers are entered by means of a pen. Reverse turn (i.e. subtraction) is not possible. Reset is done by manual forward rotation to 0.
Who was Archibald Stephenson—the inventor of this super-simple adder? Archibald Milton Stephenson was born on 2 June, 1844, near a creek called Brown's Wonder near Lebanon, Indiana, northwest of Indianapolis. He was the son of John A. Stephenson (born 1814) and Jane Jamison Stephenson (b. 1820), both native from Kentucky. Archibald had two elder sisters: Elvira Ann (1840–1909), and Mary E. (1842–1908). In 1860 the entire family moved to Tolono, Illinois. In 1863 Stephenson started his career as an agent of Illinois Central Railroad at Peotone, Illinois. Later, he became a bill clerk. In 1865 he became a travelling salesman and left Illinois, making a complete tour of the US, visiting every state and territory. Upon returning to Illinois a couple of years later, Stephenson established in Beardston and became an agent of Rockford, Rock Island & St. Louis Railroad. In early 1870s we found him in Manteno, Illinois, where he patented his adding device, but at some point he returned to Beardston, where re remained until 1879, working as an agent of the railroad company, meanwhile performing several tours as a travelling salesman. In 1879 Stephenson left the railroad business and moved to Wilmington, then to Braidwood and Braceville, Illinois, where he was engaged in the newspaper and publishing business, which he left in 1892, making another trip, covering again every US state and territory. In 1895 Stephenson setup in Joliet, starting work as a printer, then as a solicitor and again as a travelling agent. In 1906 he established his own printing company. 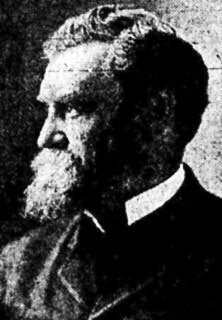 Archibald Stephenson was married to Frances Almeda Stephenson, born Wilkens (1846–1935), and they had three children (two daughters, Ura May Stephenson (b. 1873), and Alta M Stephenson (b. 1876), and a son, who died early). Stephenson belonged to a Masonic Lodge, and was a passionate republican. Archibald Milton Stephenson died on 13 September, 1913, of a stroke, at St. Luke's Hospital, Utica, New York, while on one of his selling trips as the representative of an adding machine company, and was buried in Oakwood Cemetery, Joliet.